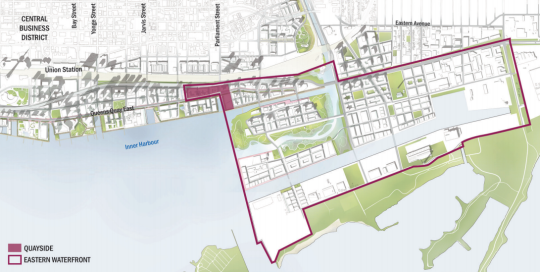 Earlier this week the WSJ announced that Sidewalk Labs (Alphabet Inc.’s urban innovation organization) is close to a deal with Waterfront Toronto to develop a new 12-acre section of the eastern waterfront. Sidewalk Labs would be their innovation and funding partner. It’s not final yet and it’s still subject to board approval, but the sentiment is that it should go. There aren’t a lot of details about the project – other than the fact that it will be fairly big, up to 3 million square feet – but the overall intent is digital city building. It’s about imagining what a city could be if you built it today “from the internet up.” More info about Sidewalk Labs, here. There’s never a guarantee that the next technology is going to be the one that moves to the center of the conversation. But it’s certain that a new technology will. It always has. I’m anxious to learn more details about the project, but this is obviously very exciting. It also creates momentum and strengthens the case for Amazon HQ2 in Toronto. The above 12-acre Quayside area is only the tip of the iceberg. There’s the rest of the eastern waterfront and also East Harbour. Some people have been critical of this city’s push for Amazon HQ2. Anthony Lacavera, chairman of Globalive Capital, called this “the biggest Trojan Horse of all time.” His view is that Amazon would simply use HQ2 Toronto as a mechanism for cheaper labor (USD > CAD) and to siphon the best and brightest down to the US. Now, I agree that it would be more impactful to create the next Amazon then to simply lure in its second headquarters. Big entrepreneurial successes are what fuel the darwinian evolution of startup hubs. The founders, early employees and investors make boatloads of money and then they start reinvesting that back into the ecosystem by, among other things, backing the next generation of entrepreneurs. But does this necessarily mean that an Amazon HQ2 would be detrimental to Toronto by acting as a conduit to the US? Will it discourage entrepreneurship? Should we eschew all US firms out of fear that this may in fact happen? I don’t think so. You can see how powerful cities are from something I wrote about earlier: the case of the Milanese Leonardo. Practically every fifteenth century Italian painter you’ve heard of was from Florence, even though Milan was just as big. People in Florence weren’t genetically different, so you have to assume there was someone born in Milan with as much natural ability as Leonardo. What happened to him? Nothing is more powerful than a community of talented people working on related problems. Genes count for little by comparison: being a genetic Leonardo was not enough to compensate for having been born near Milan instead of Florence. Today we move around more, but great work still comes disproportionately from a few hotspots: the Bauhaus, the Manhattan Project, the New Yorker, Lockheed’s Skunk Works, Xerox Parc. Xerox Parc (Palo Alto Research Company) is a great example of the kind of positive externalities that can happen as a result of smart people being in close proximity to each other while they wrestle with similar problems. It has been well documented that it was Steve Jobs’ visit to Xerox Parc that inspired many of Apple’s early innovations. So my view: let’s increase Toronto’s urban metabolism and make it the Florence of 1450. Ed Clark – who is leading the charge for HQ2 in Toronto – has been clear that large taxpayer subsidies are not on the table for Amazon. That would not be fair to the existing companies in this city. If that is what it is going to take, then we are not going to win. We will win based on our city, our human capital, and our openness to the rest of the world. That feels right. Welcome Sidewalk Labs. Welcome Amazon. This city is open for business and to new ideas.